Beyond the obvious benefits of relaxing tight muscles and reducing stress, skilled application of massage therapy can also help to break the chronic pain cycle that most of our patients live with every day. As we go through our day we tend to ignore the small aches and pains and begin to think of them as “normal”. The problem is these “normal” aches and pains are actually our body’s way of warning us that something is wrong, and if left untreated they can get out of control and become bigger issues. 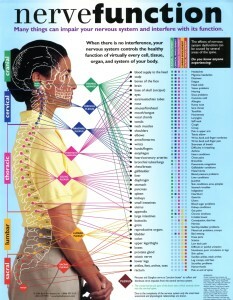 That is why it is very important to not ignore your body, and to take care of these problems as soon as they occur. Massage Therapy has been shown to be beneficial for headaches, neck pain, lower back pain, sciatica, shoulder pain, and carpal tunnel syndrome. With massage therapy treatment, you can eliminate your aches and pains without drugs or surgery, and prevent future problems from happening. Combinding the benefits of both Chiropractic and Massage, has shown amazing results by dramatically reducing pain and recovery time. The “Vertebreal subluxation” (mis-aligned vertebrea) is always effected by a contributing muscle or muscle group. Knowing this, we can take action by relaxing the specific muscles that are part of the problem.